A super easy (and delicious) method for making corned beef! 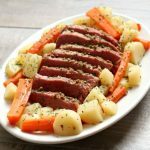 Tender corned beef is sliced and served alongside carrots and potatoes (and if you want, cabbage). It’s then topped with a tangy sauce made of sour cream, dijon mustard and garlic. A perfect dinner for St Patrick’s Day (or any other day). Place corned beef in the slow cooker. Sprinkle with seasonings (if they are included in the package). Sprinkle with brown sugar. Add the bay leaves and the broth. Cover and cook on low for 4 hours. After 4 hours add in the carrots and potatoes and cabbage (if desired). Cover and cook for 4 more hours on low. Remove the lid, move the corned beef to a platter and tent with foil. Let it rest for 10-15 minutes before serving. Use a slotted spoon to place the vegetables around the meat. Make the mustard sauce by whisking together the sour cream, dijon mustard, sugar, garlic and kosher salt. Serve corned beef and vegetables with the mustard sauce. Enjoy!